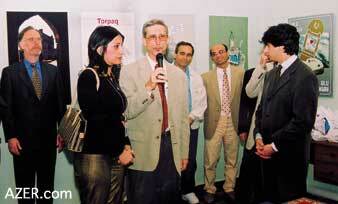 Unocal Khazar held its ninth annual "Azerbaijan Today" Poster Contest Awards Ceremony on May 23, 2002 at the Baku Art Center. The main theme of this year's contest was the preservation and protection of Azerbaijan's ethnographic, cultural and architectural legacy. Above: The Ninth Annual "Azerbaijan Today" Poster Contest Awards Ceremony. Mike Barnes (center) welcoming the art gallery visitors. First place went to artist Vugar Ali, who dedicated two of his posters to Shusha, the "cradle of Azerbaijani culture." Shusha, located in the heart of Karabakh, was an important center for Azerbaijani music and culture until Armenian military forces occupied it in 1992. As with the other occupied territories, Shusha and its important historical monuments are now in jeopardy. Another of Ali's posters depicted the idea, "Azerbaijani folk music is our most ancient memorial." As in past years, Unocal Khazar's contest exhibition also included works from Galina Churilova's Studio of Ecological Posters at the Tofig Ismayilov Palace for Children and Youth. Unocal Khazar is proud to continue the tradition of this poster contest, held in conjunction with the Baku Art Center, which serves as an expression of the people of Azerbaijan. According to Mike Barnes, Unocal Khazar's president, this year's exhibits were the best yet. Next year will mark the 10th anniversary of the Poster Contest. Unocal will celebrate this with the Baku Art Center by producing a catalog retrospective of the excellent posters submitted to the contest. It will be a chronicle of Azerbaijan's journey of independence as seen through the eyes of its poster artists.